The Supreme Court was the last legal hope of Gen. Manuel Antonio Noriega, above in 1989, to fight extradition to France. Washington (CNN) -- The U.S. Supreme Court on Monday turned away the imprisoned former leader of Panama in his effort to fight pending extradition to France to face money-laundering charges. The justices were Gen. Manuel Antonio Noriega's last legal hope, and their refusal to intervene likely clears the way for his overseas transfer. The onetime dictator of the Central American nation remains behind bars in a federal prison in Miami, Florida. He had been scheduled for release two years ago after his 1992 conviction on cocaine trafficking, racketeering and money-laundering charges, but France also has sought to try him on similar charges in that country. Noriega's attorneys argued that under international law, his status as a prisoner of war should mean he can immediately return home to Panama or another country. Justices Clarence Thomas and Antonin Scalia dissented from the court's decision to stay out of the Noriega case. A federal appeals court in Atlanta, Georgia, six months ago refused his petition for habeas corpus, noting a 2006 federal law does not allow Noriega to invoke the Geneva Conventions "as a source of rights" to demand his release from custody. Those treaties deal in part with repatriation of POWs after hostilities end. Representing the 73-year-old Noriega, attorneys Frank Rubino and Jonathan May said that lower court ruling "undermines protections that apply not only to prisoners of war in the United States but to our own men and women who find themselves prisoners of war of other nations." U.S. forces removed the ex-dictator from office during Operation Nifty Package, the 1989 invasion of Panama. 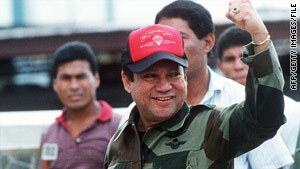 Noriega had fled his offices and tried to seek sanctuary in the Vatican Embassy in Panama City. U.S. troops set up large speakers around the compound, blaring music at all hours, a psychological ploy to rattle the general. He eventually surrendered on January 3, 1990, and was quickly escorted to the United States for civilian trial. After his drug conviction, Noriega was given POW status. His federal sentence, originally for 30 years, ended in September 2007 after time off for good behavior. But months earlier, the United States agreed to send Noriega to France. The Justice Department had ordered him held pending the resolution of his appeals. The Military Commissions Act of 2006 prohibits anyone -- including U.S. citizens -- from going to federal courts and using treaties to secure their release or to block an extradition. The final decision on when Noriega leaves the United States will rest with Secretary of State Hillary Clinton. Panama also has sought their former leader's extradition, but the United States has not honored that request.